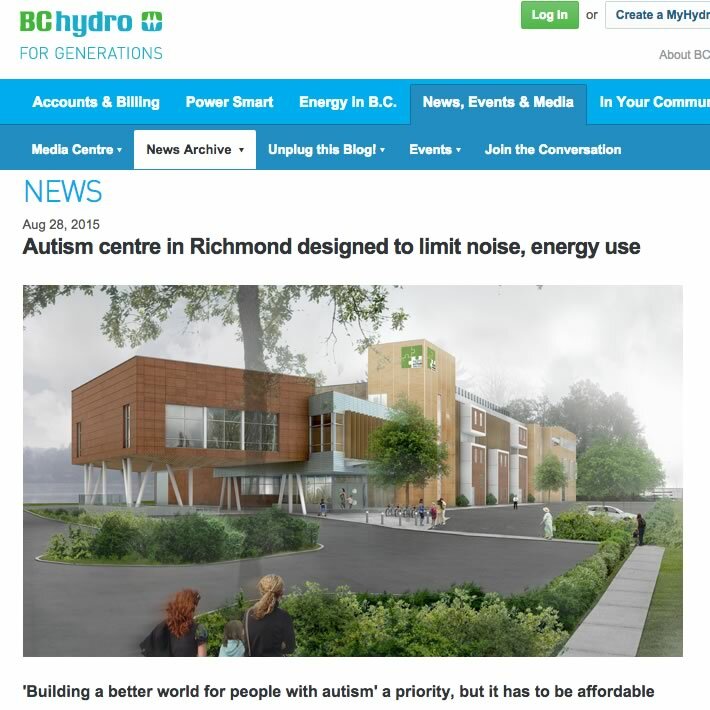 BC Hydro, Cocchia says, was instrumental in ensuring that the new Pacific Autism Family Centre, scheduled for completion in summer/fall 2016, was designed specifically for the autistic community. Research suggests that many people with ASD find noise unpleasant and even shocking. “Street noises, the noise from furnace ducts, even a whistle coming from an air conditioner can be so distracting it means the end of the ability to learn for someone with autism,” says Cocchia. But designing a building to be quiet – especially one on a busy street near a major international airport – can be very expensive. The incentives offered through BC Hydro’s New Construction Program, says Cocchia, allowed the Foundation to opt for the quietest HVAC system possible, one that also happens to be the most energy-efficient. “Without their help, we would have had to look at more traditional systems, which would not, quite frankly, have been as good,” says Cocchia. The New Construction Program provides funding for an energy-modeling study, which is essentially a simulation of how much energy a building will use day and night over a full year. Through the energy-modeling study, designers can compare various lighting, heating and cooling systems as well as windows, roofing, wall and other products, and even look at how the building is situated on the site, to determine the most energy-efficient design. The program also helps builders pay for a portion of the costs associated with installing the measures identified in the energy-modeling study.